Our friends from MotoCMS are happy to announce they are to celebrate their 9th birthday next week. The company that went a great way from a FLASH templates seller to the coolest website builder on the market and premium website design templates, is open to innovations. Today they offer the most versatile admin panel with nice blocks editor that allows creating designs with a few clicks just choosing the right block and filling it with the content. 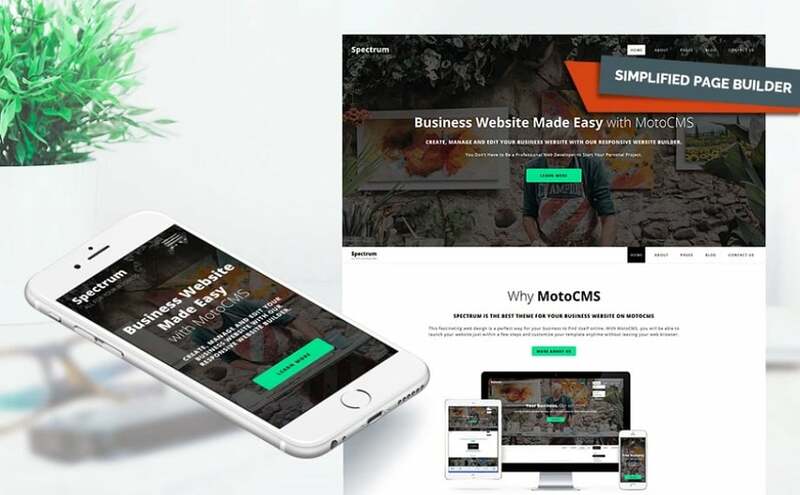 And the best thing: during their birthday celebrations, MotoCMS give all their clients a cool discount of 40% for all other website design templates in store! The sale starts November the 2nd and will last until November the 5th. Any purchase counts! You can buy a premium template, a professional logo or a web banner design or a CV builder. Three winners will be chosen by an online randomizer. Everyone wishes to find the best template for their website. But what you can consider as a criterium for what website template is the best for you? There are many factors that should be evaluated, e.g. niche, functionality, UX and much more. Here we give you another point to consider: how many users buy this theme? Best selling designs are a great investment for many reasons. Your niche may be very specific and you may not find the one template of the entire collection that fits your needs. And the best selling ones may become a real savior here. They are mostly multipurpose and can be used for many business niches. And they have the best reviews from buyers. That means – most of the clients were satisfied using these website design templates and there are likely no bugs since it was already trite and true. Here we give you MotoCMS bestsellers for 2017. There are website design templates that appeared in shopping carts of MotoCMS users the most often. We hope this collection will help you to get website design ideas. 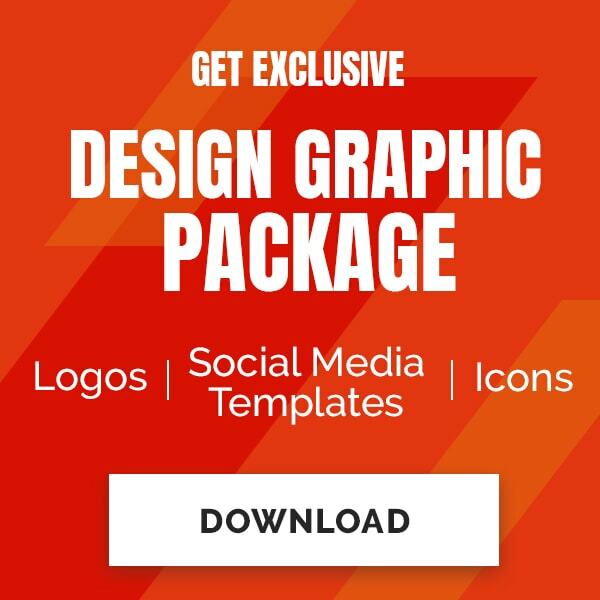 Let’s check out those amazing designs and choose something for your business or project! This ultimate business website design is made by MotoCMS team to perfectly satisfy all business needs. Being a multipurpose solution, Spectrum can serve any business or personal needs and make a great base for various projects. 17 pre-designed pages free you from a hassle of creating separate sections on your website for Team or Contacts. 4 child pages make a great choice for those who need more than one website. Evolution is another perfect multipurpose theme for business or other needs. It stores 6 Homepages for different niches: general, web design, medical, real estate, law and car repair. User-friendly admin panel with tons of tools, features, and widgets helps even a non-techie users creating a cools website in a few hours. Just choose one Child theme, set it as a Home page and drop your content inside. Over 16 ready-made additional pages will make this process a snap. 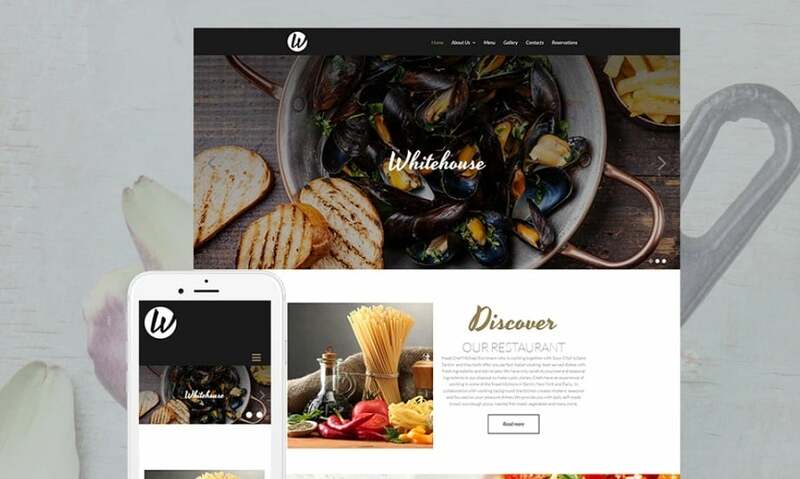 This restaurant-business theme is one of the coolest designs from MotoCMS team. Based on visuals entirely, it can be filled with your own mouthwatering images of food and drinks you serve in your restaurant or cafe. Lots of whitespace help attracting attention to your text where you can share your brand message. Set up your contact info, improve the design with the use of multiple MotoCMs widgets – and your restaurant website will shine! 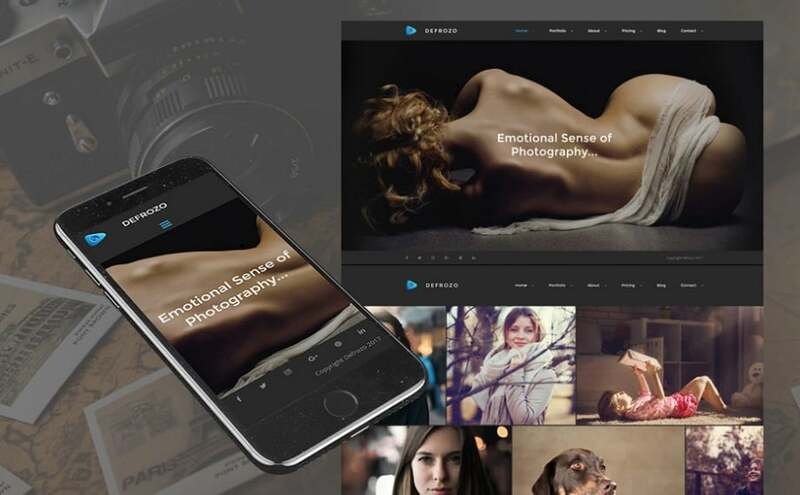 Thanks to its black-and-white design and attractive imagery, this photography template gets tons of reviews and high praises from MotoCMS clients during recent two years already. It stunning full-background images will help photographers to showcase their best works and thus attract new customers. The user-friendly file manager will help to upload content in a few clicks, saving time for other projects. 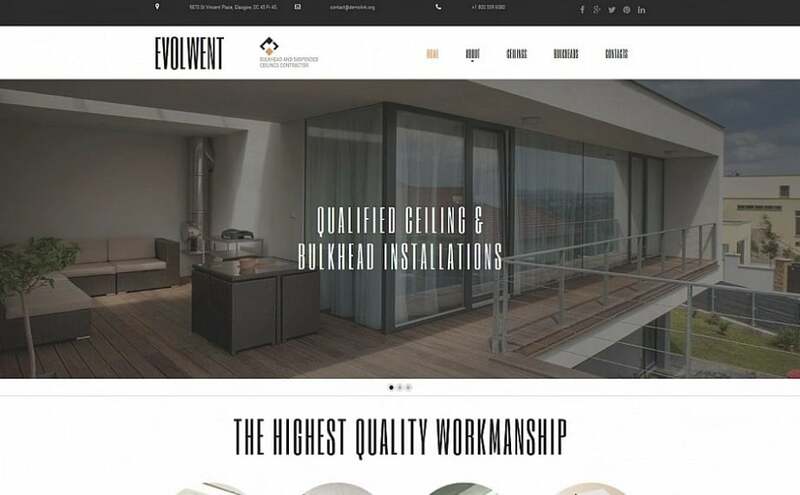 Every architecture-related agency or company will benefit from Ewolvent – a responsive and user-friendly website template. Moreover, its restrained color palette in combination with appealing photos will create an atmosphere of calm. Drag-and-drop editor inside the template with tons of MotoCMS exclusive widgets will save time and make the process of website building easy even for a novice user. It’s an elegant dark-colored website template any photographer would benefit from. 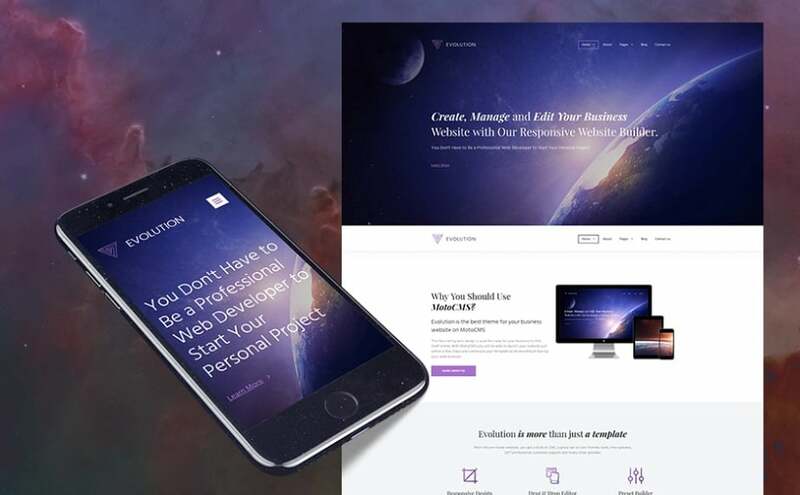 In addition, 4 ready-made website design templates for literally every page you may need on your website widen the opportunities and make the functionality of the website almost limitless. Password-protected pages make Defrozo a solid project for individuals who appreciate security on the Web. The design of Wegy is minimalist and includes lots of whitespaces. Clean layout keeps visitor’s attention to the content, and sticky menu bar helps to browse website quickly and effortlessly. Moreover, parallax effect from scrolling and over 40 types of animations help to create vibrant visuals and to attract visitors’ attention to the essential offers and information pieces. This is a perfect template for any business website: from a local one to a global agency. One of its major advantages is that Globy is a one-pager. Consequently, it makes it a pretty versatile solution for a branded website or a landing page. Furthermore, the sophisticated design incorporates bright blue accents to keep user’s attention on the page. An owner can add any content they need since this website template stores almost all existing business functionality in its handy admin panel. Car repair website should be cool-looking as Porshe 911, and reliable as Toyota 86. Undoubtedly, this unique car repair website really is the thing. Its cool asymmetric layout helps drawing attention to the main news and vital info. 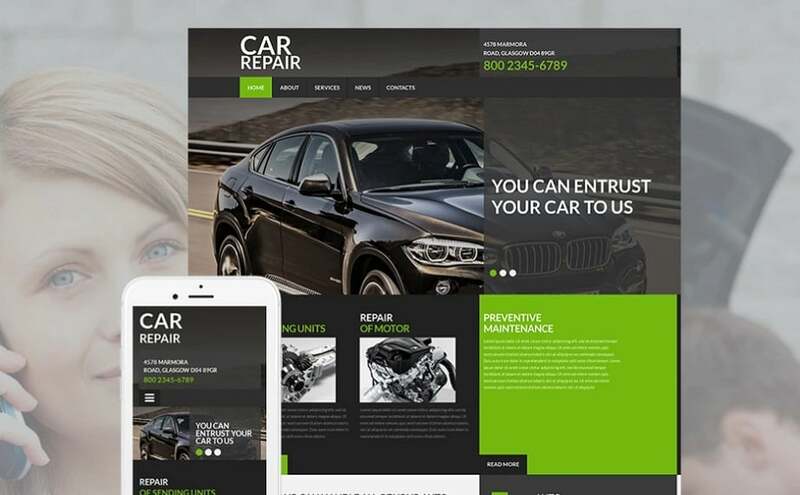 Bright green accents make this design stand out among other similar car websites. Moreover, user-aimed admin panel helps set up all features in a blink of an eye. 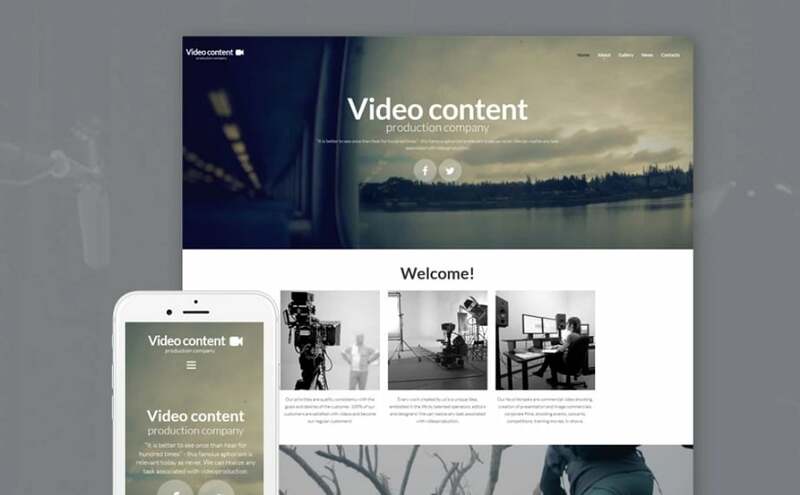 This unique template was created by MotoCMS team especially for video content agencies and individual filmmakers. Thus, one can use video integration functionality and set up the video as a background for the Home page. Video widget also allows connecting your YouTube or Vimeo account to the website and broadcasting videos from your channel right to the website page. Setup the social media widgets to get fresh feedback from your connections in social networks. We’re sure you love these website design templates! Hopefully, some of you already have a project in mind where one or two where you can use these designs. So don’t hesitate and reach out MotoCMS store to get you a shiny new website!